The Short Version: Shielding the crawlspace from the coldest winds by blocking certain foundation vents seems to have helped warm up one of the corner rooms (and possibly the rest of the house). The tools are simple – a black trash bag and black duct tape Gorilla Tape. I cut individual sections out of the trash bag, which I used to cover the vents. Then I taped them down with black duct tape. We have an old home with a vented crawlspace. It could use a number of upgrades and renovations, including under-the-floor insulation. With a recent spell of cold weather the insulation problem has been more obvious, especially since we moved our bedroom to a room that has always been the coldest in the house. I’ve added insulation above the room and some weather stripping around the windows, but the floor itself remained cold. This weekend I decided to block the foundation vents on the walls where the room is located (in a corner of the house). The reason I decided to do this is because I realized the vents under that room face the same direction most of the cold wind comes from. In addition, there are no obstructions to slow the cold air before it enters the crawlspace on that side. I looked into purchasing some vent covers (solid and foam). While I may eventually do this I still needed a temporary fix, especially since it wasn’t looking like I’d be able to find those items in town. 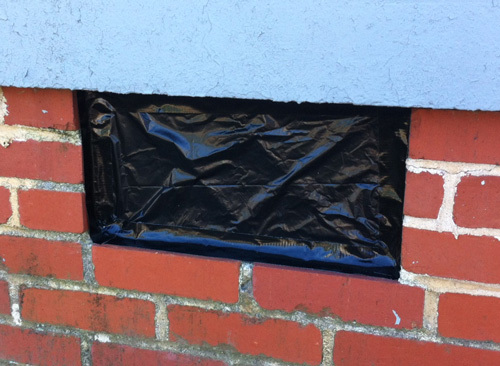 I surfed the Web some more and found one forum post where an individual suggested using trash bags and tape to block the vents. I decided to measure the vents, cut rectangular sections from a black trash bag, and tape them into place using black duct tape. Sure enough, it seems to have helped. I’m not sure if the duct tape will hold for long – I didn’t clean the bricks before applying it but considering that the trash bag pieces were practically sucked into the vents I don’t think it will be much of an issue for the remainder of the cold season. While it’s only been a few hours since I put them in place I think they’re already helping. According to a cheap sensor I set on the floor it’s already detected a four degree increase in temperature. The floor even feels slightly warmer, though I won’t have a better idea of how effective it is until later tonight. Note that I didn’t cover up all vents. The information on the Web often conflicts, but with our house I think it would be a bad idea to cover up all of the vents – I suspect we need to spend some time (and money) working on moisture control in the crawlspace, so the last thing I’d want to do is completely trap the moisture under the house, especially since ours is old and mostly wooden. I only covered up the vents that were exposed to the cold winds. Update: It’s been several hours since I blocked those foundation vents and I’ve already noticed a significant improvement. Not only is the floor warmer than it was but so is the room. In addition, this side of the house seems to be a little bit easier to heat. Blocking those vents may have been the most important weather-proofing step I’ve taken since we moved in. We know that we need to add insulation under the floor. There are a few spots here and there between boards where it’s easy to feel a slight draft. Blocking the vents will slow the heat loss through our floor during cold, winter days. Updated 02/21/2012: Several of the top sections of the covers fell, most likely because the duct tape simply couldn’t adhere well to the brick and concrete. I’m going to use Gorilla Tape instead of regular duct tape.